Then he went away with his wife, came home, and told her to ask something of her mother. “Mother, have you any cedar bark?” “Yes, chief-woman, my daughter.” Then she gave him some. They dried it around the fire, went to work upon it, and pounded it up for cedar-bark rings. 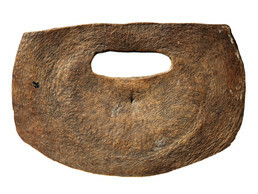 Cedar tree people appear in Haida oral tradition, and cedar bark, so present in daily life, was known as “every woman’s elder sister.” Women used a flat bone tool like this one to split yellow cedar bark into layers, selecting the bright-colored inner material for plaiting baskets and mats. They dried and shredded red cedar bark by draping it over a paddle or other sharp edge and beating it with the same tool. They transformed the softened bark into ceremonial rings, rain cloaks, hats, and blankets.